Thursday, September 27, 2018, 9:45 a.m. 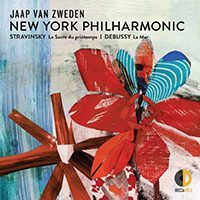 In honor of the launch of New York Philharmonic Music Director Jaap van Zweden’s tenure, New Yorkers can see Jaap van Zweden at a Free Open Rehearsal on September 27, 2018. The program will feature Conrad Tao’s Everything Must Go, receiving its World Premiere that evening, and Bruckner’s Symphony No. 8. Following the Free Open Rehearsal — a gift from Jaap van Zweden and the Orchestra — Maestro van Zweden will stay onstage for a chat with President and CEO Deborah Borda and composer Conrad Tao. General admission tickets will be handed out on a first-come, first-served basis, one per person, starting that morning at 9:00 a.m. on Lincoln Center’s Josie Robertson Plaza. Beginning at 8:00 a.m., WFMT’s Seth Boustead will host entertainment for fans waiting in line, including performances by Philharmonic musicians, interviews with composer Conrad Tao and others, and a ticket raffle. Prizes will be given to the first 25 fans in line. Previous Free Open Rehearsals have drawn thousands of music lovers to David Geffen Hall.